Once again, Microsoft has managed to rile people with Windows 10. People have discovered that the Windows 10 installation files are being downloaded to their computers without their permission. If this has happened to you already, we've already shown you how to remove Windows 10, claiming back space and regaining control. But if you have been lucky enough to avoid the unwanted arrival of Windows 10 installation files so far, you'll be more interested in prevention than a cure. Here's what you need to do to make sure Microsoft doesn’t force feed you Windows 10. 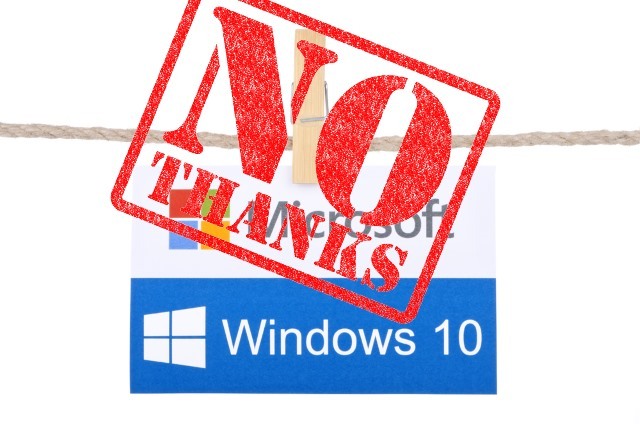 Microsoft may not be installing Windows 10 without people's permission, but in "help[ing] upgradable devices get ready for Windows 10 by downloading the files they’ll need if they decide to upgrade" the company has still upset a lot of people. You could disable Automatic Updates in Windows 7 or Windows 8.1, but this would mean missing out on important security updates as they are released. A better solution, as suggested over on How To Geek, is to edit the registry and block this particular download. Start by patching Windows Update Client. If you're using Windows 7 you need this file, while Windows 8.1 users need this one. Fire up the Registry Editor by hitting the Windows key and R, type regedit, and press Enter. Navigate to HKEY_LOCAL_MACHINE\SOFTWARE\Policies\ Microsoft\Windows\ and create a new key called WindowsUpdate. Under this key create a new 32-bit DWORD called DisableOSUpgrade, double click it and set its value to 1. Should you ever change your mind about upgrading to Windows 10, you'll have to either delete DisableOSUpgrade or change its value to 0. If you're trying to avoid downloading Windows 10, what method have you decided to use?